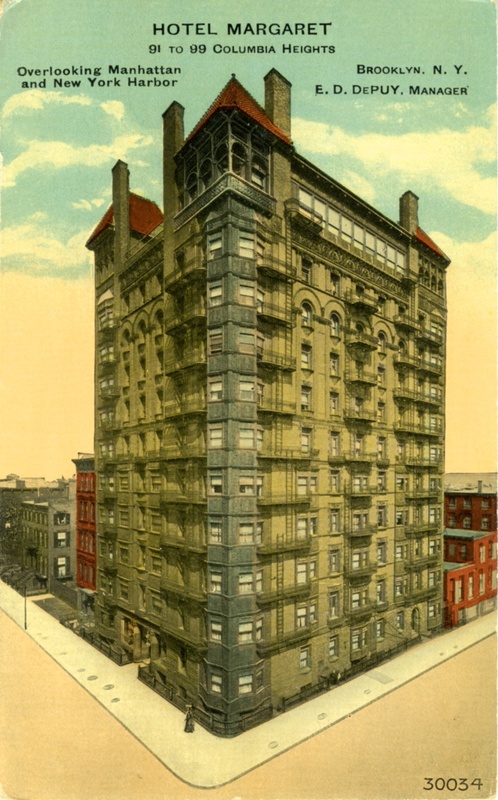 The storied Hotel Margaret, which Brooklynites such as famed etcher Joseph Pennell called home, pre-dated the Great Consolidation of Brooklyn into one of the five boroughs of New York City. Sadly, the hotel was destroyed in a fire 39 years ago this week. And it was not the only fire in the history of the Hotel Margaret. That first fire, on Nov. 23, 1923, drove out about 200 guests into a heavy rainstorm. The Brooklyn Eagle of Nov. 24, 1923, reported that the city’s highest water tower still could not reach the top of the Hotel Margaret. 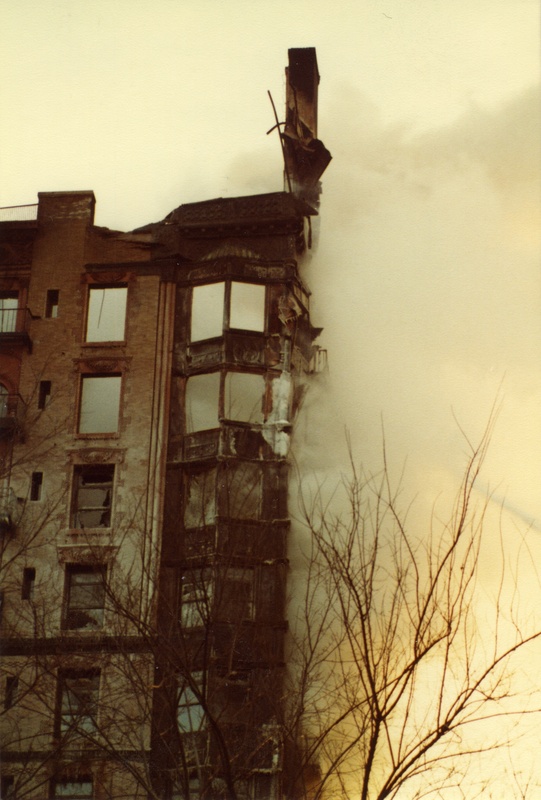 The fire decades later that destroyed the Margaret was sparked on Friday, Feb. 1 1980, during renovations to the building at 91-99 Columbia Heights. Amid frigid weather conditions, it took days for firemen to bring it under control. As firemen fought the blaze, water from their hoses froze on the building’s fire escapes, creating an eerie sculpture. Brooklyn Heights Press photographer Amy Davis chronicled this story of fire and ice. Margaret Hotel in all its glory. Architect Frank Freeman — whose Herman Behr mansion on Pierrepont and Henry streets was another masterpiece — designed the hotel. The first owner was coffee and sugar magnate John Arbuckle, who named the hotel for his sister, Margaret. Widely-respected Brooklyn Eagle columnist Margaret Mara wrote of the hotel and the Arbuckle family in a May 21, 1951, feature, “As seen from the hotel, Brooklyn Bridge is like a gigantic etching, with its graceful outline and its tremendous network of cables. “Hotel Margaret was the home of one of America’s most famous etchers, the late Joseph Pennell. Foreign notables who resided there briefly while visiting here included British actress Ellen Terry and H.G. Wells, author. Spectators at the scene of the continuing Hotel Margaret Fire, photographed February 3, 1980, were dressed for the bitterly cold weather. Note the man at left center holding mitts to his frozen ears. Mara noted also that the Arbuckles were a prominent Plymouth Church family. Another sister named Christina founded the Plymouth Institute and bequeathed memorial buildings to Long Island College Hospital and the Brooklyn Hospital. Other stories from the original Brooklyn Eagle archives describe the purchase of adjacent land to expand the Hotel Margaret. One story chronicles a visit from the Prince of Wales who would later become King Edward VIII of England — and still later abdicate the British throne for love of an American divorcee. Developer Bruce Eichner, who owned the 97 Columbia Heights site, later built a completely new structure, which for a time was a residence for the Watchtower Bible & Tract Society, until they moved their headquarters upstate a few years ago. A New York City records website shows that the entire building was sold in 2017 for $58 million. I was there through the night, and was interviewed by CBS News Radio for it. It did not take “days” to bring it under control; it was under control by the following morning. I believe the fire was started by an unattended worker’s heater. The building was to be converted into condos, and was very close to being finished. The Margaret was also used in the filming of Taxi Driver. Here, previously unpublished, is one of my photos from the fire—in color! I have several other photos from the fire, both during and after.